I’m afraid of garages. I admit it. My childhood memories of the garage are of my father screaming profanities and launching Craftsman missiles, which ricocheted dangerously through the air. As I grew, little changed that perception. Trips to the local mechanic for my own car were always fraught with men far manlier than me, covered in oil and babbling in curses and gibberish-jargon. So it was with some apprehension that I approached Alternative Auto Care for my meeting with the proprietor and president, Chris Cozad. Much to my relief, the garage was not only scrupulously clean, it was altogether free of flying wrenches and gear-heads. The atmosphere felt professional and the technicians were friendly and personable. I felt no pressure to chew tobacco or mumble any of the few “car words” that I know. Every technician is ASE certified; Cozad is an ASE Master Technician and recently achieved ASE Advanced Engine Performance Specialist and Service Consultant certifications. And Cozad is that rarity in the automotive industry: a woman. 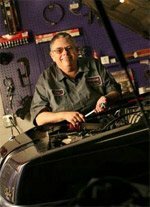 Cozad, who also teaches automotive repair at Columbus State Community College, has been in the industry for 25 years, the last 24 of which were spent operating her own garage.